Junkers Ju.87 Dive Bomber "Stuka"
Image From: Richard Bickers. The Battle of Britain. Military Archive Research Services photo. The most famous Sturzkampfflugzeug (dive bomber) was the one nicknamed Stuka. It was the most famous of all planes used by the Germans as a divebomber. The Stuka was designed strictly as an army cooperation divebomber at the urging of General Ernst Udet. It is instantly recognisable with its inverted gull-wings, and fixed-undercarriage. The Ju 87 was ugly, sturdy, accurate, but very vulnerable to enemy fighters. The Germans learned in the Battle of Britain that its use demanded air superiority. It was too slow, unmanoeuverable and underarmed, but its effectiveness in destroying vehicles, fortifications or ships, or just scaring people, was undoubted. Its accuracy was high when in a full dive that was up to 80 degrees. Once the bomb was released it used an automatic pull-up system to ensure that the plane pulled out of the dive even if the pilot blacked out from the high g forces. The Germans fitted the wheel covers with sirens that were used once the planes went into a dive to shatter the morale of enemy troops and civilians. They also fitted whistles onto the fins of the bombs to ensure that the recipients knew just when the bombs were released and could track them on the way down. Over 5700 Stukas were built. 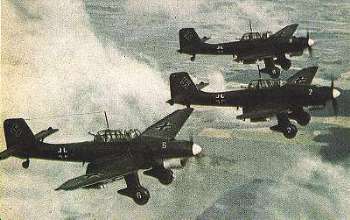 The Ju 87B-1 flew with a crew of 2, the pilot and a rear-gunner. The engine was an 880kW Junkers Jumo 211Da that could pull the aircraft up to 385km/h. It had an operational ceiling of 8000m and a range of only 600km. Its armament was three 7.9mm machine guns and either one 500kg bomb or four 50kg bombs fitted to racks either under the fusilage or under the inboard portion of the wings. From 1942 on the Ju 87G-1 was a dedicated anti-tank aircraft on the eastern front. It was fitted with a 1400hp Junkers Jumo 211J engine. It had a maximum speed of 314km/h, a ceiling of 8000m and a very limited range of only 320km. The reduced speed and range was due to the armour plating installed to protect the pilot and gunner when flying low-level tank busting missions. It was armed with two 30mm cannons in pods under the wings and a 7.92mm machine gun in the back for the gunner.